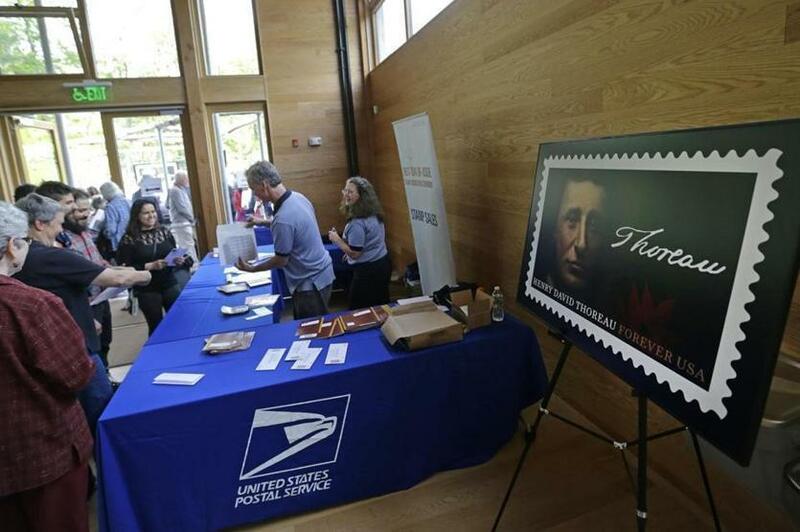 People line up to buy stamps after the dedication of the US Postal Service’s new Henry David Thoreau postage stamp Tuesday at Walden Pond in Concord. On the day he would turn 200 years old, Henry David Thoreau will be celebrated on July 12 at his birthplace in Concord with the special dedication of a recently released Forever stamp honoring him. The US Postal Service will join with the Thoreau Farm and Birthplace to commemorate the life of the writer, philosopher, and naturalist on Wednesday at 4 p.m., according to a press release. Concord Postmaster Ray White and officials from the Thoreau Farm will highlight the 19th century Transcendentalist’s “personal example of simple living, his criticism of materialism, and the timeless questions he raises about the place of the individual in society,” the release states. The postage stamp, which was dedicated in May at Walden Pond, where Thoreau lived in solitude for two years, features an oil-on-panel painting of Thoreau’s face based on a famous 1856 daguerreotype by Benjamin Maxham. Jake Johnson can be reached at jake.johnson@globe.com.